Field Dispatch: Bombardments on Sudan’s Disputed Border: Hint of What’s to Come? KIIR ADEM, Southern Sudan — Aerial bombardments by the Sudanese Armed Forces of a South Sudanese army installation and surrounding community conjure up memories of Sudan’s long civil war and underscore the fragility of peace, especially along the country’s long, contested border. A few media outlets have published short reports since the first bombing took place on November 11 on a disputed stretch of the border between the South’s Northern Bahr el Ghazal state and the North’s South Darfur state. But much has changed since initial reports on the incident, which indicated that the northern and southern army had agreed the attack was a “mistake.” Now, no one in the area is talking anymore of an accident. The relatively minimal reaction from the Government of Southern Sudan and sparse coverage of the bombing incidents masks how tense and worrisome the situation has become in a stretch of the North-South border that hasn’t been particularly highlighted as a flashpoint. Enough recently traveled to the bombing site in Kiir Adem, accompanied by the SPLA for security reasons. Kiir Adem is a town of mostly Dinka in a disputed territory along the border. The town is situated on a bend in the Kiir River (known in Arabic as the Bahr el Arab), where tall green reeds growing on either side highlight the fertility of an otherwise dry and dusty area. The river access is essential for both the Dinka and the Rizeigat ethnic group from South Darfur, particularly during the dry season. The town lies about 14 miles north of the 1956 border between the southern state of Northern Bahr el Ghazal and the northern state of South Darfur. But according to civilians and southern soldiers living in the area, the river forms the boundary. On November 11, the Sudanese Armed Forces dropped at least one bomb in the area, according to Maj. Gen. Wol. However, he emphasized that the attack took place on the north side of the river and thus not in their territory. “We do not count that one,” Maj. Gen. Wol said. The next day, November 12, SAF Antonovs and Chinese-made MiG fighter jets dropped an undetermined number of bombs on the SPLA base and civilian community in Kiir Adem, on the south side of the river. Five civilians – three children and two adults – and seven soldiers were wounded. The bombs reportedly damaged a market area, left two craters, burned 12 SPLA and an undetermined number of civilian huts, and ripped through a tree. On the afternoon of November 24, MiGs dropped bombs on the area again, which by then was mostly inhabited by soldiers, as the majority of civilians had fled. Three or four soldiers were injured. According to the commander in Kiir Adem, SAF planes have regularly conducted flyovers of the area ever since the first bombing took place. The local chief in Kiir Adem said that before the aerial bombardments started 5,000 civilians lived in the town. Now, just 293 people remain, he said. Based on interviews, many of them seem to be family members of the large SPLA army base in town. A day after the November 12 bombing of Kiir Adem took place, a spokesman for the Sudanese Armed Forces confirmed the attack and stated that the intended target was the Justice and Equality Movement, or JEM, Darfur’s most militarily strong rebel group. SAF spokesman al-Sawarmi Khaled accused the SPLA of supporting the JEM, an allegation that the southern governor of the state flatly denied. "There are no Darfur rebels that I know operating in Northern Bahr el-Ghazal. I have never seen them,” Governor Paul Malong Awan Anei told the Sudan Tribune. 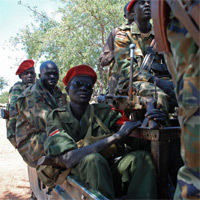 “Who said they are in Northern Bahr el-Ghazal should have told you where they are operating,” he said. Evidence of JEM’s presence in Northern Bahr el Ghazal and, moreover, proof of SPLA support of JEM, would be a closely held secret. In the absence of any firm evidence, the possibility of southern support for Darfur rebels is a provocative issue. At a moment when the southern government is locked in talks with the North over crucial post-referendum arrangements, GOSS could be aiming to increase its leverage in negotiations by supporting spoilers in the North. On the other hand, support for JEM could risk the collapse of an already fragile political relationship with Khartoum. For the referendum-minded southern government, such a move may be seen as too large a gamble. Of course, given the relative ease with which civilians and soldiers alike can move across the North-South border, and the vast openness of South Sudan’s west, it is also feasible that Darfuri rebels cross into the South unnoticed and unregulated. “We have not responded to the bombings but we’ve asked what is the reason. If we respond, we’re worried we will spoil our referendum,” Santino said. However, one eyewitness account from a non-military source contradicted the official line that the SPLA has not responded militarily. In addition to the two round of attacks on Kiir Adem, the SPLA and civilians living in Kiir Adem report regular flyovers by SAF Antonovs and MiG fighter planes. As noted above, the second round of bombings took place on November 24. The next day, a team of southern state and military officials as well as internationals visited Kiir Adem and witnessed two flyovers by SAF planes. According to a source who could not be named because of the sensitivity of the information, the SPLA fired at the MiG planes with anti-aircraft artillery on both occasions but missed. In addition to slight discrepancies in casualty numbers, displacement stats, and dates of the bombings, a key question remains unanswered: If the Sudanese Armed Forces wanted to take out the SPLA base and artillery entirely or completely clear the area of civilians, why weren’t the bombings more damaging? SPLA commanders based in Kiir Adem claimed numerous times that SAF was targeting the bridge; but why then is the bridge still standing? In the absence of a significant retaliatory attack by the SPLA, SAF planes presumably could have quickly targeted and destroyed the SPLA armaments in Kiir Adem. Suggestions by SPLA officials that the Antonov and MiG bombs are not precise and repeatedly missed their targets seem unconvincing, particularly considering the history of the brutally effective SAF aerial bombardments in Darfur and during the North-South war. If SAF does not intend to fully neutralize the SPLA on that section of the border, one explanation could be that the northern army intends to point out the presence of the SPLA in disputed territory and fire some warning shots to assert SAF strength, amid allegations of a SPLA-JEM patronage. The ambiguity of the territory both enables the SAF to send its warning message and diminishes the SPLA’s ability to react. Driving north toward Kiir Adem, the road is not highly trafficked; many of the male pedestrians are dressed as civilians but tote weapons. Women walk along carrying goods or water. The few vehicles are often full of soldiers. The most noticeable landmark of the hour drive on the day of Enough’s visit was anti-tank artillery parked off the side of the road, just before reaching the Kiir River and the bridge SAF allegedly targeted. South Darfur is just on the other side, the commander said. But according to the 1956 map, which the Comprehensive Peace Agreement determined is the line that should be demarcated, the SPLA convoy would have crossed the North-South border 14 miles south of the river. By bombing the SPLA military installation and surrounding communities multiple times, the SAF has established that the southern army and communities are indeed deployed well north of the 1956 boundary, a reminder that clear lines on a map are often not reflective of the realities on the ground. Whether calculated or not, the Sudanese government appears to be using the question of boundaries to its advantage, to test the SPLA’s reaction and increase its leverage over a potential JEM-SPLA link, while GOSS focuses on the referendum. The question is, what will happen when the referendum is over and the border demarcation team arrives.